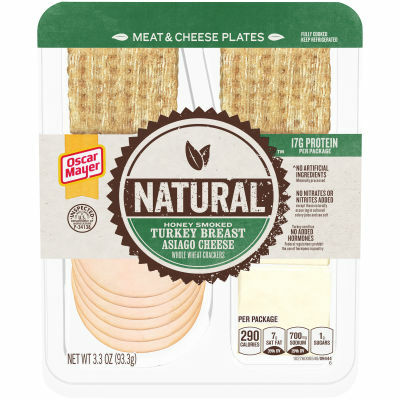 Oscar Mayer Natural Meat & Cheese Plates, the natural way to snack on the go. Whether you're searching for a mid-morning meal to hold you till lunch, a tasty snack for the family, or anything in between, reach for Oscar Mayer Natural Meat & Cheese Plates. With mouth-watering options like Honey Smoked Turkey, Asiago Cheese & Whole Wheat Crackers, no artificial preservatives, and up to 17g of protein per pack, it’s the perfect grab & go, all-natural choice to get everything you love, and nothing you don’t.